The tropical location of Tenerife, Canary Islands, an island archipelago off the western coast of Africa, makes it a perfect winter and spring destination. The island has striking volcanic landscapes, and many species of plants and animals that are found only there. Tenerife was referred to by Charles Darwin as ‘perhaps one of the most interesting places in the world’. This holiday is guided by Marian Sutton BSc. Hons Earth Science, MSc. Biodiversity and Conservation. Tenerife is one of her favourite places; it has great walking and a huge variety of interesting landscapes and ecosystems. The highest summit is Mount Teide, an active volcano higher than any mountain in mainland Spain, and the third highest oceanic volcano in the world at 3718m above sea level. She has previously run natural history and earth science field courses on Tenerife, as well as walking holidays. The holiday is based at the comfortable and very welcoming Hotel Alta Montana in the little mountain spa town of Vilaflor and allows you to discover the often ignored sub-tropical landscape of Tenerife – so unexpected if you only associate Tenerife with tourists and beaches! 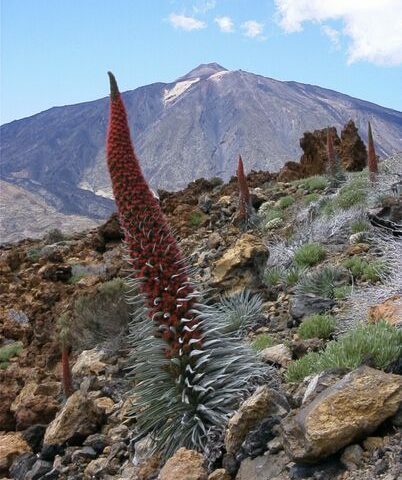 High above the coast – and often above the clouds – are extraordinary walks through volcanic scenery where the summit, Teide, is surrounded by fantastic old lava flows and the rim of a huge crater. Teide can be visited by cable car on the free day, or we’ll get breathtaking views when we walk up Guajara peak on the crater rim 2715m above sea level, we walk the last 565m of ascent, crater floor to Guajara summit. 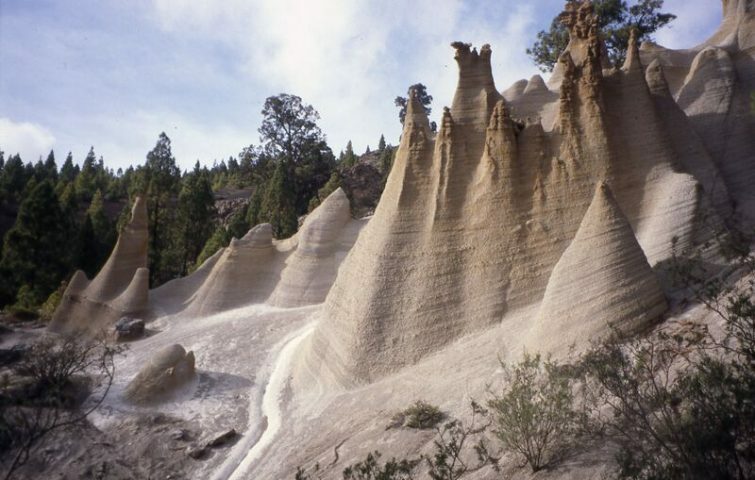 Lower down and level with Vilaflor is a corona of pine forest encircling the island, and from the hotel we can walk beneath the pines, skirting spectacular ravines called barrancos or exploring the fascinating rocks of the Paisaje Lunar (Lunar Landscape). Hotel Alta Montana offers comfortable ensuite twin and single rooms, a swimming pool, a generous breakfast and packed lunches. Evening meals, organised by your guide are in Vilaflor’s small restaurants (not included from £10). We will meet at arrivals in Tenerife South airport for our transfer to Hotel Alta Montaña in Vilaflor. Once we have settled into the hotel we will have a short holiday briefing and then take time to explore the mountain spa town of Vilaflor before enjoying our evening meal. Today we take a short 20-minute drive up through scenic mountain forest to the rim of the crater, just within Teide National Park. Declared a National Park in 1954, it includes an enormous volcanic crater 30 miles (48 km) in circumference, out of which rises Mount Teide 12,200 feet (3,718 metres), making it the highest peak in the whole of Spain (It is the third largest volcano in the world from its base on the ocean floor). Our walk today starts just inside the crater rim, at around 2000m altitude, so no problem for healthy average walkers. To begin we walk a flat path through lava fields and Cañadas, areas of volcanic gravel, and then the path climbs to a pass with superb views over the southern corner of the Cañadas National Park, Pico Viejo and Guajara Peak. From the pass we ascend through some pine forest to reach the crater rim and Montaña del Cedro, from here we have views back toward the sea, and on a clear day, it is possible to see the islands of La Gomera and La Palma. We will stop for our picnic lunch near here, and then continue on a route around Montaña del Cedro, where we can see tiny natural springs high on the ridge and walk through open pine woods. Our minibus will meet us to take us back to Hotel Alta Montaña where we can relax and eat dinner. After a short 20-minute drive down to Ifonche we head off on today’s walk. It’s a spectacular circular walk in the south of the island, with mountain views, a hidden valley, tropical plants and historic agricultural settlements. We circumnavigate the Roque Imonde, and return to our drop off point to be met by our transport which will take us back to Hotel Alta Montaña. After breakfast, we take a 30-minute drive up into Cañadas National Park. Today we venture further into the park, where we climb Montaña Blanca, a pumice mountain on the flank of Mount Teide. This walk incorporates the lower slopes of Teide and Teides eggs, before crossing the northern portion of Cañadas. This beautiful and extraordinary landscape has been used as a location in many films, and in 2007 the park was named a World Heritage Site by UNESCO. We end the days walk at the visitor centre where we will be met by Señora Agustina and her taxi. Today we will climb Guajara, the second highest point on the island. After a 30 minute drive we start our walk on an initially flat path, passing interesting rock formations and high altitude tropical vegetation. We will take the climb up Guajara at a sensible speed as we are heading for the summit at 2717m. We ascend a total of 600m with stunning views to reward our efforts. There is a public café bar at the Parador Hotel for celebratory drinks before being met by Señora Agustina and her taxi. Today is a free day. You may choose to relax by the hotel pool and maybe wander into Vilaflor. There may also be an option to visit a local spa. If you would prefer to go further afield your guide can help with walk and transport information. After breakfast we walk from the hotel, picking up our trail to Paisaje Lunar from Vilaflor. The path follows old mule tracks, and in places ancient routes used by the original island people to move their flocks between high summer grazing in Las Cañadas, and lower winter pastures in the South. We pass through open pine forest in places and can stop for lunch at the ‘Campamento Madre del Agua’, a camping ground named ‘Mother of Water’ after the high altitude springs in the mountains above. A little further and we reach the lunar landscape of Paisaje Lunar. After exploring and photography we return on foot to the hotel for our evening meal. After breakfast at the hotel, we will head to the airport for our return flights. Price includes: 7 nights bed and breakfast in twin ensuite rooms, 5 lunches, transfer meeting certain flights, all transport to walks. Single ensuite rooms available if you book early – £15 per night supplement.